Sleek, European design that blends with any kitchen. Bosch stainless steel chimney hoods integrate matching user interfaces and design aesthetics to complete the Bosch kitchen suite with sleek and sophisticated styling reminiscent of European design. With 300 and 600 CFM options, beautiful Bosch hoods will quickly clear the air of grease, steam, smoke and odour to keep your home fresh and odour free. A place for everything, and everything in its well-designed place. Our German-engineered dishwashers not only feature up to three racks of flexible loading space, they also incorporate 18 unique sound reducing technologies, making Bosch the quietest dishwasher brand in the U.S.1 And every Bosch dishwasher features sleek, flush, European styling that works in harmony with a variety of kitchen styles. Three brilliant ways to cook. One exceptional way to engineer them. Whether you choose gas, electric or induction, sleek European design and precise cooking performance is built into every Bosch cooktop. High heat and low simmer options on burners offer optimal cooking flexibility. Our Benchmark" gas cooktops feature a dual-stacked burner that delivers both low simmer and 20,000 BTUs. With easy-to-clean glass surfaces and grates as well as solid stainless steel frames and die-cast metal knobs, our quality German engineering really shows. Whatever your kitchen design, Bosch wall ovens offer optimum design flexibility. Bosch wall ovens balance form and function. They integrate seamlessly into your kitchen, installing flush for a sleek European look or proud for a more traditional look. Bosch wall ovens look great installed together or separately, and can be installed horizontally for perfect design alignment next to another oven, or in a vertical stacked configuration. 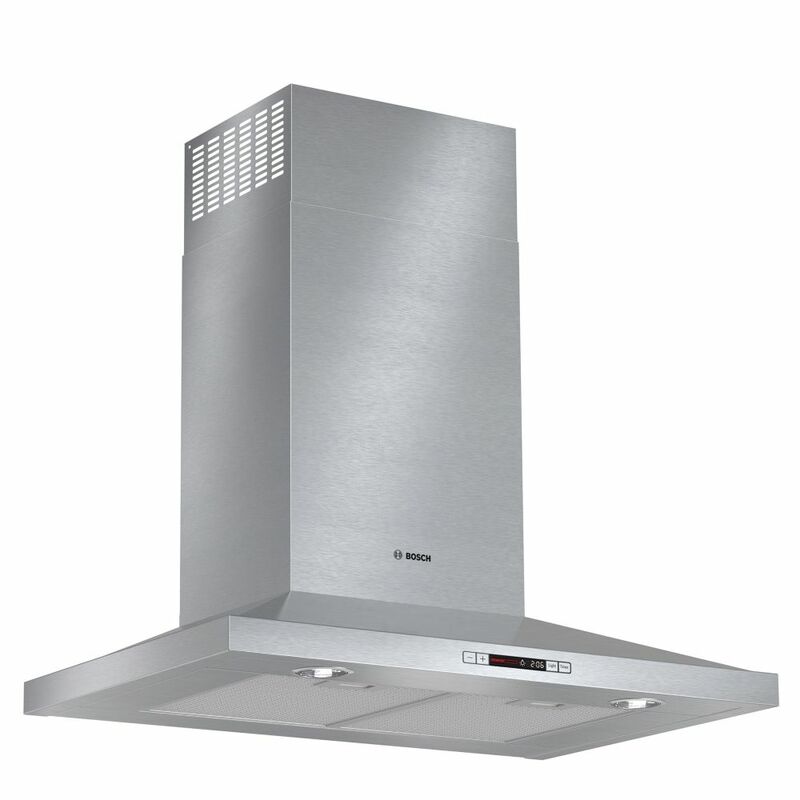 300 Series - 30 inch Pyramid Canopy Chimeny Hood - 600 CFM Sleek, European design that blends with any kitchen. Bosch stainless steel chimney hoods integrate matching user interfaces and design aesthetics to complete the Bosch kitchen suite with sleek and sophisticated styling reminiscent of European design. With 300 and 600 CFM options, beautiful Bosch hoods will quickly clear the air of grease, steam, smoke and odour to keep your home fresh and odour free. 300 Series - 30 inch Pyramid Canopy Chimeny Hood - 600 CFM is rated 4.3 out of 5 by 3.
what is the noise level - either in sones of dBa?